Ten-year-old Jake struggles to understand his grandma’ s death. But as he spends two weeks at his grandfather’ s home, he is able to receive answers to his questions about Heaven. ^As Jake and Grandpa fish, watch the stars, and take long walks, Grandpa shares what the Bible says about the reality and beauty of Heaven. As Jake learns the truth about Heaven, he begins to better understand and accept his grandmother’ s death. ^As readers uncover the truths in the dialogue between Grandpa and Jake, they will better appreciate the home that awaits all who place their faith in Christ. - Publisher Randy Alcornwas a pastor before founding Eternal Perspective Ministries. He is also the author ofHeavenand more than twenty other books. The parents of two daughters, Randy and his wife, Nanci, live in Oregon near their wonderful grandsons, Jake, Matthew, and Ty.Ron DiCiannireceived national acclaim for his work with such major companies and organizations as McDonald's, the U. S. Olympic Committee, and the Smithsonian Institution before deciding to devote his talents solely to God's Kingdom. He is the originator and artist of Crossway's award-winning "Tell Me" series. DiCianni and his wife, Pat, live in California and have two grown sons. 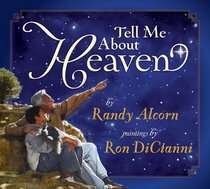 About "Tell Me About Heaven"
Randy Alcornwas a pastor before founding Eternal Perspective Ministries. He is also the author ofHeavenand more than twenty other books. The parents of two daughters, Randy and his wife, Nanci, live in Oregon near their wonderful grandsons, Jake, Matthew, and Ty.Ron DiCiannireceived national acclaim for his work with such major companies and organizations as McDonald's, the U. S. Olympic Committee, and the Smithsonian Institution before deciding to devote his talents solely to God's Kingdom. He is the originator and artist of Crossway's award-winning "Tell Me" series. DiCianni and his wife, Pat, live in California and have two grown sons. Randy is the author of Heaven which has sold over 4 million copies as well as the novel Courageous.Eternity with Kingstone Media is his first graphic novel. Ron DiCianni received national acclaim for his work with many large companies and organizations before deciding to devote his talents solely to God's Kingdom more than a decade ago. He is the originator and artist of Crossway's entire award-winning "Tell Me" series.